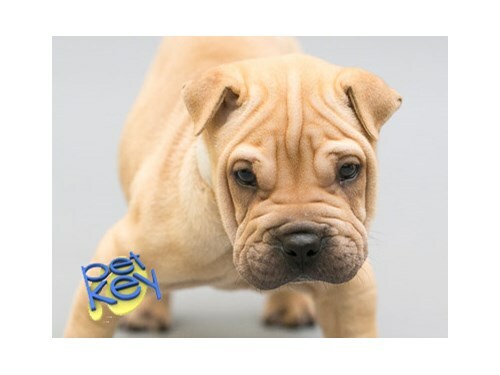 Both heavily wrinkled dogs with large heads and smaller headed dogs with tighter looking skins occur in this breed. There are three coat varieties: horse-coat and brush-coat and a rare bear-coat, which is not recognized by the AKC. Coat colors include all solid colors and sables. Playful, active, dominant, and brave. They bond with their family, but are not unfriendly toward strangers. The Shar PeiÆs ancestry is uncertain. It may be a descendant of the Chow Chow, however, the only clear link between these are the purple tongue. However, pictures on pottery suggest the breed was present even in the Han Dynasty. For many years the Shar Pei was kept as a general-purpose farm dog in the Chinese countryside, used for hunting, protecting stock, and guarding the home and family.